Santiago Cimadevilla was born in Buenos Aires, Argentina. He played guitar from a young age and studied classical piano at the Conservatorio Municipal Manuel de Falla. In the Netherlands he studied bandoneon at the Rotterdam Conservatory with Victor Villena and Leo Vervelde. After his graduation concert he was awarded with a prize from the Foundation Friends of the Rotterdam Conservatory for outstanding study results and artistic quality. He was also awarded with the prestigious Huygens Scholarship Programme in order to pursue a Master’s degree studying composition and arrangements with Gustavo Beytelmann. During his studies at the Rotterdam Conservatory he was a regular member of Orquesta Tipica OTRA, for which he also wrote several original compositions and arrangements. With this orchestra he performed in most of the major concert halls in the Netherlands including the Concertgebouw and the Tropen Theater, and went often on tours to Germany, France and Belgium. As a tango music performer he has worked with many renowned musicians and ensembles in Europe. He was asked to play with Orquesta Tipica Fernandez Fierro during their first European tour and was invited several times to perform as a special guest with tango legend Alfredo Marcucci’s Sexteto Veritango. He is regularly invited to perform with classical ensembles and orchestras. He has often performed Kurt Weill’s Kleine Dreigroschenmusik, with among others the Schönberg Ensemble (with Reinbert de Leeuw), the Netherlands Radio Philharmonic Orchestra (with Werner Herbers), and the Nationaal Jeugdorkest (with Etienne Siebens). He has also often performed Luis Bacalov’s Misa Tango with various orchestras. 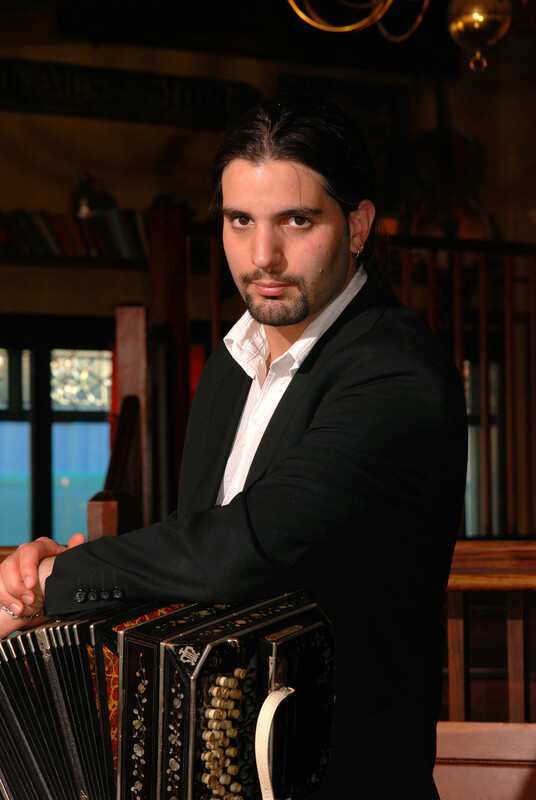 He has performed as a soloist several of Astor Piazzolla’s concertos for bandoneon and orchestra, such as the Concierto para Bandoneon (Aconcagua) with Liepaja’s Symphony Orchestra (Latvia) and the Doble Concierto para Bandoneon y Guitarra at the Mozarteum in Salzburg with guitar soloist Federico Diaz Paez and conductor Federico Abiuso. He also arranged and performed Piazzolla’s Four Seasons with the Manchester Camerata conducted by Gordan Nikolitch at the Royal Northern College of Music (Manchester). He has often been involved in contemporary music projects. With the Helios Ensemble conducted by Wolfgang Lange he performed Trajectoire by Daan Manneke and Magnificat by Astrid Kruisselbrink, and he also performed several works by composer Mathis Nitschke such as Jetzt (with the Orchestre National Montpellier), Gatno Tango and Waiting for the Tango. Among his specialties in the tango field are Astor Piazzolla’s original works for quintet. He performs often this repertoire with several bands, including Tango 5 in England and Grupo del Sur in The Netherlands. He has also arranged Piazzolla’s work and other highlights of the tango repertoire for a wide range of ensembles, including string orchestras and chamber groups. In 2007 he was asked to perform and arrange tango music for the RNW’s (Radio Netherlands) jubileum celebration at the Concertgebouw in Amsterdam, where he shared the stage with artists such as Bløf, Trilok Gurtu, Tania Kross and Randal Corsen. He also performs regularly throughout Europe as a soloist and with projects with musicians and ensembles such as Flautango in Bremen (with Efrain Oscher and Gustavo Lanzon), the Orquesta Tipica Tangarte in Sweden (with Juanjo Passo), and Tango 5 in England. He is currently the bandoneon player for Los Taitas (with Hernan Ruiz and Orlando Miño) and the Hernan Ruiz Trio, La Sieste du Dromadaire with Ananta Roosens, Tango 5 (England), and performs often in duo with Marcos Di Paolo. Besides this he recently founded TRASNOCHE, a new quintet with Ebred Reijnen, Elliott Muusses, Mark Wyman and Virgilio Monti for which he has composed and arranged an all-original repertoire. During the season 2016 - 2017, Santiago is performing Astor Piazzolla's Maria de Buenos Aires in a production of Theater Bremen directed by Andreas Kriegenburg. Santiago is also a founding member of Splendor, the newest stage for the performing arts in Amsterdam as well as an independent collective effort of musicians, composers, writers and other artists, and works as teacher as well as supervisor of Artistic Research in the Master of Music department at CODARTS, University of the Arts (Rotterdam Conservatory). 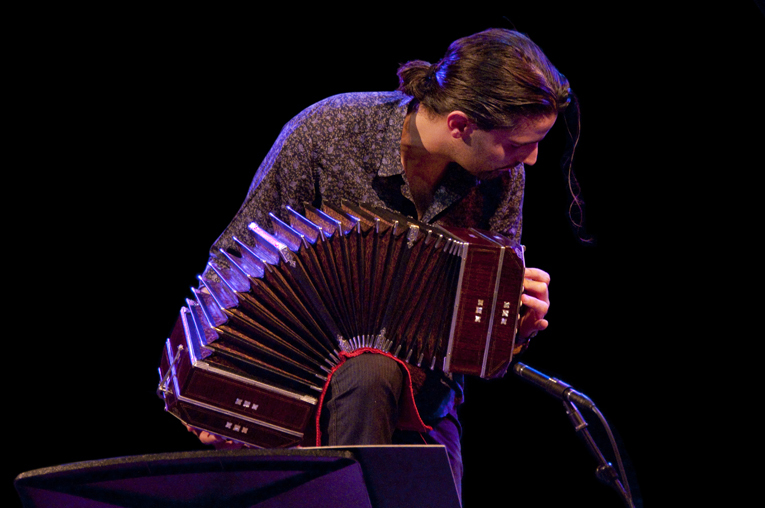 During his career, Santiago has performed with: Federico Abiuso, Beatriz Aguiar, Marcos Baggiani, Robert Bakker, Cristian Basto, Frans Bauer, Tom Beek, Peter Beijersbergen van Henegouwen, Ruud Bergamin, Gustavo Beytelmann, Solenne Burgelin, Paul van Brugge, Guardia Cadenera, Manchester Camerata, Aisling Casey, Guillermo Celano, Randal Corsen, Tango Dorado, Ben van den Dungen, Ronald Ent, Schoenberg Ensemble, Helios Ensemble, Tango Extremo, Orquesta Tipica Fernandez Fierro, Enrique Firpi, Enrique Folger, Heinz Friesen, Het Gelders Orkest, Mabel Gonzalez, Ivo de Greef, Anne-Marie van de Grint, Guillaume Grosbard, Paul Haagenaars, Adelina Hasani, Christiaan van Hemert, Werner Herbers, Andre Heuvelman, Johan van Iersel, André Kaart, Bert van Kooten, Rob van Kreeveld, Wolfgang Lange, Peter Lawson, Peter Leerdam, Daniël Lehmann, Sonja van Lier, Cor van der Linden, Martijn van der Linden, Bernard Loonen, Jamie Manson, Alfredo Marcucci, Maaike Martens, Tom McKinney, Vince Mendoza, Matthew Midgley, Floris Mijnders, Orlando Miño, Micha Molthoff, Virgilio Monti, Elliot Muusses, Sjoerd Nijenhuis, Gordan Nikolitch, Mathis Nitschke, Liepaja Symphony Orchestra, Maria Jose Ortiz, Federico Diaz Paez, Marcos Di Paolo, Julian Peralta, Peter Prommel, Mala Pinta, Quirijn van Regteren Altena, Ebred Reijnen, Irina Simon-Renes, Hernan Reinaudo, Marc van Rooij, Ananta Roosens, Hernan Ruiz, Judy Ruks, David Routledge, Bart Schneeman, Vaughan Schlepp, Kay Sleking, Brice Soniano, Hetty Sponselee, Joost Swart, Kenny Talkowski, Trio Tangata, Olaf Tarenskeen, Barbara Varassi, Joris Vanvinckenroye, Ed Verschuren, Leo Vervelde, Jeroen Vierdag, Wilmar de Visser, Danny van de Wal, Wim Warman, Michiel Weidner, Carlo de Wijs, Mark Wyman, and many others.